A lack of tolerance to modern social problems - along with repeated child abuse and money laundering allegations - is forcing the congregation away from the Catholic Church, Keith Porteous Wood of the International Secular Society told RT. 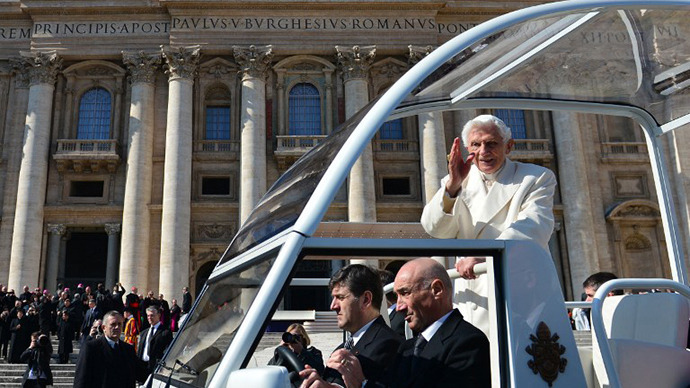 Failure to deal with these issues, as well as other “symptomatic” failures, is partly the reason why Pope Benedict XVI is stepping down, Porteous Wood argues. RT:One of the growing allegations right now is that there is some sort of influential gay network operating within the Vatican. What do you think? If there is anything behind that? Is that why the pope is leaving, or is there no mileage in that at all? Keith Porteous Wood: I think, it is symptomatic of the fact that he has lost control, which that whole episode over his butler showed that very strongly. But, I think there are several other important factors playing as well. I’m certainly aware of two major issues over child abuses that are going to come up and are going to be very, very hard for the Vatican to swallow. Because it is not like it is the child abuse, bad though that is, is the issue - it is actually that the finger of blame is going to be pointed at the Vatican for having obstructed justice and all the secret files that it won’t release. So, that is going to look very, very bad, and I think people will get less and less tolerant about that. And the Vatican has shown no real sign of actually coming to terms with this, of putting its hands up and really atoning for its past sins, and being much more open and dealing more properly with victims and actually getting the people who perpetrated these crimes turned over to the police. RT:It begs the question: why not? Why have they not done that? KPW: The Vatican has forever been an organization that is only interested in its own power and preserving its own reputation and its own finances - it has always been thus. But with the kind off communications we have today, they can’t get away with that any longer. And the stronger regulatory powers as well - that is also coming around to hit them quite big time on money laundering. I mean, there have been rumors for ages about the way the internal banking of the Vatican works. In fact, they could not even get the credit cards working in their museums. It's so humiliating, and so symbolic of the complete breakdown of the system. They just can’t get away with that any longer either. And it is very interesting that his grace, even though he was right at the end, that Cardinal O’Brien from the UK said that he thought it was about time that priests should be allowed to marry, which may also be behind some of the child abuse problems. I think the time has come: the church has to make up its own mind, it is not for me to tell it, but I think an awful lot of people are thinking it is time they ought to be much more open to modern thinking over issues like these, and also their obsession with contraception is so damaging in the third world to women, to women’s health, to overpopulation. That is something that is so quiet and not talked about, but it is catastrophic in its implications. RT:What does the Church need to do now, to change all the negative things you’re talking about? KPW: The outgoing pope has to pad the college of cardinals with people who are not more conservative then he is, so it is going to be pretty hard. But if they’ve got any sense they should look and see that the vast majority of Catholics don’t actually agree with all the positions of the sensitive social issues. And I think, they actually need to look at their own congregation, and start taking some signs from that, and be much more sensible over issues like contraception, homosexuality, abortion - all those kinds off things - and actually be open to secular justice on matters such as child abuse and money laundering.